Growing up in a suburban development had its advantages. There was very little traffic and in summer we would take off on our bikes, not returning home until dinner. The woods behind our house held all sorts of possibilities. Building forts. Hunting for salamanders and tadpoles. Searching for (but never picking) Lady Slipper orchids. After supper, we congregated in the street and marked out a playing field for kickball. There were a dozen or so of us close enough in age to make it work and we played until it was too dark to see. Every year, to celebrate the end of school, the neighbors organized a block party. The street was cordoned off with sawhorses, tables set up end to end, and families gathered with an array of baskets and Tupperware containers. While this was all very pleasant, the high point of the evening was the ride to the Big Scoop ice cream stand. The family across the street owned (and still owns) a construction company, and Mr. R. would drive home a monstrous dump truck for the occasion. Parents and children piled into the open bed and off we went, barreling down Route 1 and screaming with glee. After pulling into the dusty parking lot - where do you park a dump truck? - we clambered down to buy our cones, no doubt oblivious to the spectacle we created. We were convinced this was THE best adventure ever and once home, Mr. R would raise the truck bed slightly - as if to dump us out - for one final thrill. More screams and laughter! I can't imagine this happening today but so glad to have this happy memory. On another ice cream note, I've been reading "Falling Cloudberries" by Tessa Kiros. I love this cookbook. I have read it cover to cover, twice, and dog-eared pages of recipes I want to try. It is a beautiful book, gorgeous photography and contains wonderful stories and recipes. Her description of her Greek-Cypriot grandfather reminds me so much of my own papou. 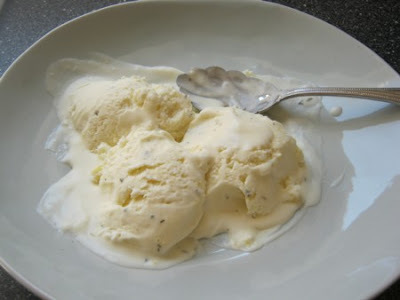 The cookbook has several recipes for ice cream that can be made without an ice cream maker. Homemade ice cream is something I've wanted to try but didn't want another small appliance taking up space, seldom used. 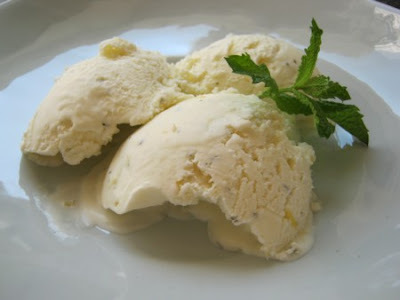 So, for a first try, I've made the lemon ice cream. It is fresh and lemony, and instead of sage I added a little mint. 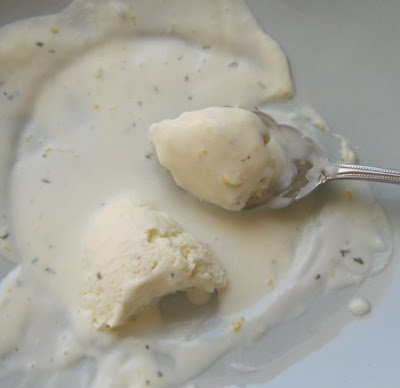 The author suggests trying other herbs - thyme, rosemary, etc - which will need to be strained before churning. I chopped the mint very finely, didn't bother straining it out, and it worked fine. Put the cream. lemon zest and sage in a saucepan and bring slowly to a boil. Set aside to cool and infuse the lemon and sage flavors into the cream. 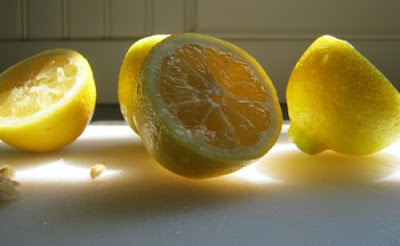 Meanwhile, whisk the sugar with the lemon juice and add 1 tablespoon of the cream mixture until the sugar dissolves. Add the remaining cream mixture and whisk well for a couple of minutes. Transfer to a bowl, cover and put in the freezer. After an hour, remove the bowl from the freezer, give an energetic whisk with a whisk or electric mixer, and return the bowl to the freezer. Whisk again after another couple of hours. When it is nearly firm, give one last whisk, transfer to a suitable freezing container with a lid, and let it chill in the freezer until it is firm. Alternatively, pour the mixture into your ice cream machine and freeze, following the manufacturer's instructions. Thank you for sharing such a wonderful (and fun) summer memory! I can just imagine all of you happily tumbling out of that dump truck for your ice cream cones! The recipe sounds delicious - I wonder if there is such a thing as soy whipping cream?! I've never heard of that book before, thanks for introducing it to me. I bought my first ice cream machine about a month ago and I've been making all kinds of ice cream. This one will have to be made as well. Sounds wonderful.